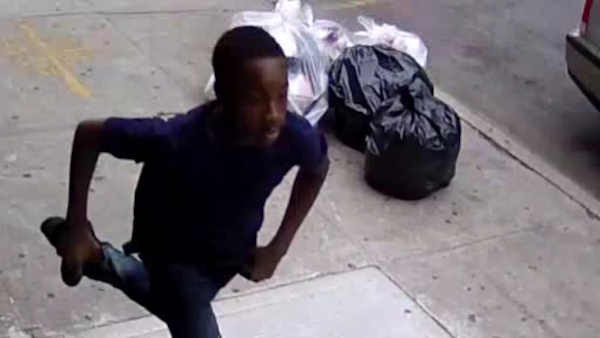 MIDWOOD, Brooklyn (WABC) -- Police are looking for a teenage suspect wanted in connection with a hate crime investigation in Brooklyn. Investigators say the teen shouted an anti-Semitic slur, then threw a rock through the side window of a van driving up Nostrand Avenue in Midwood. It happened late Tuesday afternoon. The Jewish woman driving was unharmed, and the rock narrowly missed her 6-year-old child in the backseat. The suspect got away, last seen fleeing on foot southbound on Nostrand Avenue. The teen is described as approximately 14-years-old, 5'6" tall, weighing 130 lbs., with short black hair. He was last seen wearing blue jeans, a blue t-shirt and black sneakers.